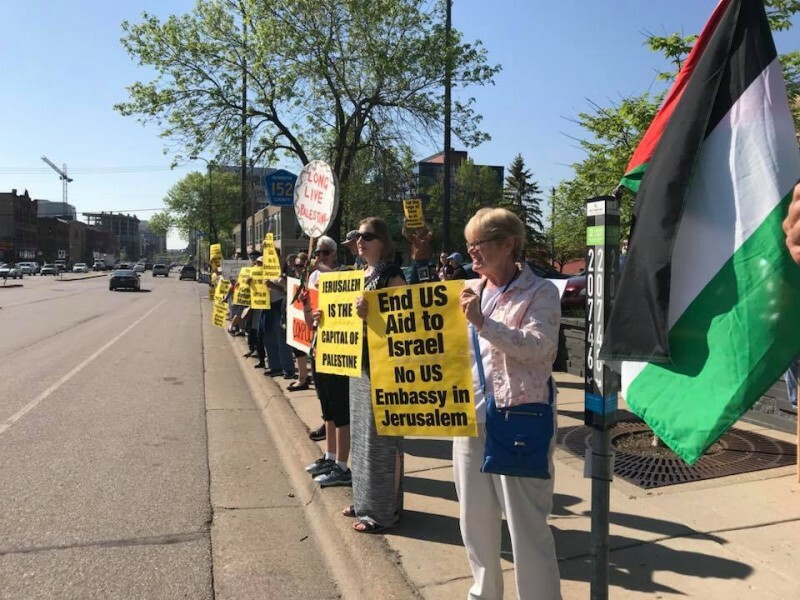 Minnesota protests Israeli massacre on 70th anniversary of Al Nakba | Fight Back! 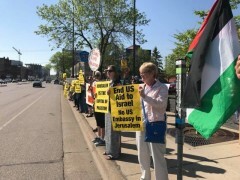 Minneapolis, MN - Over 100 people protested outside Senator Amy Klobuchar’s office at the intersection of Interstate 35W and Washington Avenue in Minneapolis on May 15. The protest was originally called to mark the 70th anniversary of the 1948 Al Nakba massacre, “The Catastrophe” in Arabic, but it was overshadowed by the Israeli massacre in Gaza the day before, where at least 58 Palestinian protesters were killed by the Israeli military. Last month, Palestinians in Gaza began “The Great Return March,” a plan to engage in six weeks of protest. The march began on Land Day, March 30, and continued to the anniversary of Al Nakba. An estimated 30,000 Palestinian men, women and children participated on the first day of demonstrations. Palestinians are camping out in tents along the northern and eastern edges of the Gaza Strip to highlight their right to return to their homes. Israeli soldiers opened fire on the unarmed protesters on Land Day and there have been casualties mounting over the six weeks. However, the May 14 attack was the deadliest since 2014, with 58 people killed and 2271 wounded. The protest was co-sponsored by the Middle East Committee of Women Against Military Madness and the MN Anti-War Committee. It was endorsed by the MN Peace Action Coalition, Students for Democracy UMN, and MN BDS Community.